Dungannon’s lowly season continues and at Stevenson Park on Saturday they were demolished in the AIL by a five try blitz in the second half. Injuries to skipper, James Bates and influential forward, Bryan Davidson did not help but take nothing away from Banbridge they were simply oozing confidence long before the finish. The result means that Dungannon go into the New Year rooted to the bottom of the table along with Bective and Seapoint, all three having lost out at the weekend. Banbridge kicked off and during their first meaningful attack a harsh yellow card within two minutes left the home side with 14 men. Aaron Kennedy popped over the simple penalty and Bann moved 3-0 in front. Meanwhile, John McGuckin stepped in at the out-half spot and Dungannon held ground until the 13th minute when Jack Milligan returned to level matters with a penalty. From the restart Paul Magee made a notable break that led to a lineout near the right hand corner. An equally impressive drive then paved the way for Peter Gilkinson to crash over midway through the half. Milligan added the extras and the home side led 10-3. 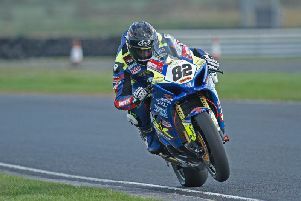 Following the impressive start Dungannon then suffered setbacks. Davidson left the field on 25 minutes and shortly afterwards he was followed by Bates. Bann pressed forward and Kennedy closed the gap with a penalty on the half hour. The Down men were now starting to control affairs and added two tries before the break. First it was centre, Jonathan Little and then 3 minutes later, Adam Doherty. Kennedy converted both and then added a penalty to give Bann a 23-10 lead at the break. Alas for Dungannon, Bann remained in overdrive in the second half adding three tries in the third quarter. Andrew Morrison dotted down on 45 minutes before John Porter grabbed the bonus point try five minutes later. Kennedy converted the latter and Bann were cruising at 35-10. Doherty then completed his brace with Kennedy converting to leave the visitors out of sight at 42-10. Despite some notable breaks from Milligan and McGuckin, Dungannon could not get back in the game and the Down men added two further tries in the final quarter. First it was left winger, Clark McAllister before Stephen Irvine registered one for the forward unit as Bann ran out easy 52-10 winners. Dungannon: John McGuckin, Matthew Montgomery, Mark Faloon, Paul Magee, Gerard Treanor, Jack Milligan, James Bates (cap), Steven Sinnamon, Karl Egan, Glen Sinnamon, Bryan Davidson, Simon McCarroll, Peter Gilkinson, David Leyburn, Stephen Todd. Reps: Marcus Mulgrew, Jack Ravey, Daniel Maxwell, Sean O’Hagan, Tim Smith. Banbridge: Adam Doherty, John Porter, Andrew Morrison, Jonathan Little, Clark McAllister, Jonathan Pollock, Aaron Kennedy, Stuart Cromie, Jonathan Weir, James McCrum, Christopher Allen, Jonathan Graham, Nico Vorster, Dale Carson, Stephen Irvine. Reps: Timothy Savage, John McCreery, Alan Conn, Shandon Scott, Chris Leathem. Fixtures: Boxing Day: Ballymena v Dungannon for the Jack Kyle Cup.